Are you relocating to a new home or office? Here is a beginners' guide to packing up, with advice from what moving supplies you need to labeling and organizing your moving boxes. 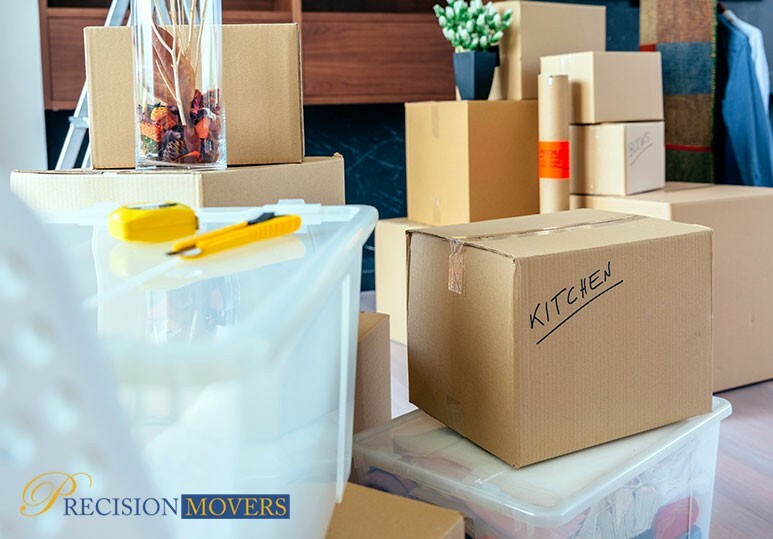 While it can be very exciting to move into your dream home or a bigger office space, moving can be a very stressful and overwhelming experience, especially when you’re doing it alone! Precision Movers have been successfully relocating Calgarian home and business owners for over thirty years. We have the expertise, experience, moving supplies, and equipment to make your relocation as simple, easy, and stress free as possible! A large part of the stress of moving has to do with packing up an entire home or office. While it may seem impossible at first, with the right moving supplies, organisation, and expertise, packing up can be a breeze! REMEMBER: Packing and moving can be a HUGE task, but just like with any big job, it becomes significantly easier with the proper tools and supplies. Moving boxes are one of the most essential moving supplies you’ll need during a relocation and choosing them carefully is very important. The wrong moving boxes may be too heavy to lift, or not strong enough to protect your fragile belongings. You may want to consider specialty boxes such as those made specifically to carry dishes, electronics, mirrors, and clothes for the best possible protection for your belongings. One of the biggest advantages of a relocation is that it forces you to make a clean sweep of your home, getting rid of items that you no longer use or need. Doing so will not only ensure a more simplified packing process, but will significantly reduce your moving costs! The easiest way of packing up quickly and efficiently is by delegating activities to each family member. This will save you significant time, and gets the entire family involved in the excitement of moving. When you are organizing your packing boxes, make sure to have some for the entire family, and then individual moving boxes that each member takes care of on their own. Hiring professional movers to help organize and pack your belongings before a relocation can save you a lot of stress, frustration, and unnecessary costs because they have the expertise and right moving supplies to do the job quickly and correctly. Ensure all furniture is taken apart, properly wrapped, and secured using padding & protective wrapping. Have the right moving supplies to ensure that none of your items get chipped, damaged, or broken during the relocation. Be able to get your items packed and stored much faster, leading to a more efficient and cost-effective move. To find out more about our relocation services including luxury furniture, safe, and piano moving, contact our Calgary office at 403-540-4393 or fill in our online contact form.